Residential swing set seats, from the top suppliers in the playground business. These residential swing parts are tough, durable, and reasonably priced. They’re hand-picked by Certified Playground Safety Inspectors (CPSIs). Unlike many sellers of discount commercial playground parts, we will never sell factory seconds or used parts. The swing seat selection includes to-fro swing seats, tire swing seats, and special needs swing seats. You’ll like our residential swing seats so much, we think you’ll order swing parts from us time and again! These swingset seats are easy to install, with only basic tools. So, you can rely on Maryland Materials for residential swing seats that stand up to the test of time — and the kids! These high quality swing parts are made from sturdy polymer plastics. They meet all the standards for home and residential playground use. Note: to attach the seats to the swing chains, you will need swing fasteners. Seats do not include chains. For school-age children. Many colors! Comes with ropes and chain adjustment. Many colors! Ready to hang on your home playset. Many colors! Ready to hang on your home swingset. Many colors! This hollow plastic seat is firm yet comfortable. Flexible, but with more support than belt seats. This flat seat is sturdy and doesn’t bend. Flat rubber seat witheyebolts attached and aluminum insert. Flat rubber seat with A-brackets and aluminum insert. Completely enclosed plastic toddler seat. Many colors! Home and Residential Swing Seats :: MADE IN THE USA! 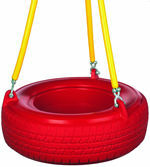 Our very best American-made products give your playground the toughness you need. They cost a little more than foreign parts, but they’re heavier and sturdier — you can feel the difference. Note: swing chains are sold separately. 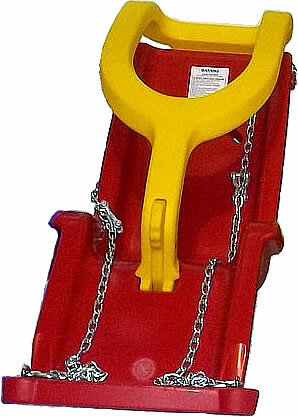 To attach the seats to the swing chains, you will need swing connectors. For non-USA products, see the next section below. Sturdy elastomer seats for home use. Many colors! Full-bucket polymer seats. Many colors! These seats meet all your ADA requirements. Swing chains are sold separately. To attach the seat to the swing chains, you will need fasteners. To order these seats, please phone us toll free (some must ship via motor freight). Everything you need for your home tireswing, including tires, eye bolts, and hangers. The swing hanger connects the chains above the tire swing to the play structure. To attach the swing chains to the swing hanger, you’ll need swing swing fasteners. Note: the tires don’t come with chains or fasteners, unless otherwise stated. Tough, yet lightweight, this tire is made from hollow roto-molded plastic. 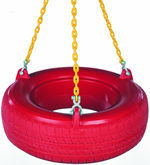 Everything you need to add a new tire swing to an existing hanger, using plastisol chains. Everything you need to add a new tire swing to an existing hanger, using tube chains. An authentic tire from a NASCAR race. Shown with optional eye bolts.